Today I woke early (yet again) to the sound of the ship scraping through ice floes, so I got myself out of bed and took the recorder down to the hull of the ship to get some good slushy crunchy sounds. After that there was still plenty of time before breakfast to go above deck and watch the scenery – ice floes alternating with open sea. 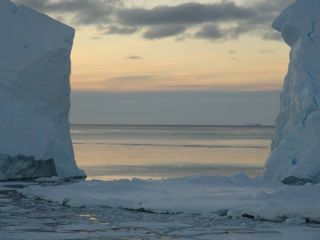 Fairly early on we arrived at the edge of the shelf ice that is preventing our getting close to Mawson, and ‘parked’ the ship by driving into it – the ice has snow on top and is soft enough at the edge to plough into it. Scott (Master) and the Voyage leader Andy went on a helicopter trip to check the best way forward for us. Meanwhile several other helicopter trips to Mawson were made, carrying firstly those who will help with the cargo operations. This evening shorty after dinner the decision was made on our direction and we have had the most spectacular and beautiful experience yet. 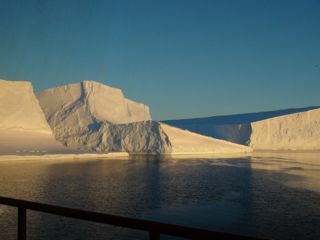 Everyone was up on deck or the bridge as we traveled between huge icebergs in the soft colours of the setting sun – pale pinks and pastels amidst the bright clarity and stillness of the blue-white bergs. The sea was smooth as a lake and I couldn’t help the tears pouring down my cheeks for the beauty of it: I feel I will always remember this scene within me as a metaphor for purity and serenity. This entry was posted on Thursday, February 24th, 2011 at 7:51 pm	and posted in Uncategorized. You can follow any responses to this entry through the RSS 2.0 feed. You have arrived! I have been eagerly checking as many updates as I can find, both on your blog and the ships site reps as my partner is due to come home from Mawson on the ship. Your post above was beautiful, and I can only imagine how moving the raw and natural beauty of the place is. I hope the experience only gets better for you and that the rest of the voyage goes smoothly! Say hi to Dan for me!